Mexico provided around half of German imported oil needs pre 1939,but after that date new surces of supply were needed. As a highly developed industrial state, Germany was dependent even in peacetime on external sources for an adequate supply of oil. Even though Germany’s 1938 oil consumption of little more than 44 million barrels was considerably less than Great Britain’s 76 million barrels, Russia’s 183 million barrels, and the one billion barrels used by the United States, in wartime Germany’s needs for an adequate supply of liquid fuel would be absolutely essential for successful military operations on the ground and, even more so, in the air.For Germany, it was precisely the outbreak of the war in 1939 and the concurrent termination of overseas imports that most endangered its ability to conduct mobile warfare. German oil supplies came from three different sources: imports of crude and finished petroleum products from abroad, production by domestic oil fields, and syntheses of petroleum products from coal. In 1938, of the total consumption of 44 million barrels, imports from overseas accounted for 28 million barrels or roughly 60 percent of the total supply. An additional 3.8 million barrels were imported overland from European sources (2.8 million barrels came from Romania alone), and another 3.8 million barrels were derived from domestic oil production. The remainder of the total, 9 million barrels, were produced synthetically. Although the total overseas imports were even higher in 1939 before the onset of the blockade in September (33 million barrels), this high proportion of overseas imports only indicated how precarious the fuel situation would become should Germany be cut off from them. At the outbreak of the war, Germany’s stockpiles of fuel consisted of a total of 15 million barrels. The campaigns in Norway, Holland, Belgium, and France added another 5 million barrels in booty, and imports from the Soviet Union accounted for 4 million barrels in 1940 and 1.6 million barrels in the first half of 1941. Yet a High Command study in May of 1941 noted that with monthly military requirements for 7.25 million barrels and imports and home production of only 5.35 million barrels, German stocks would be exhausted by August 1941. The 26 percent shortfall could only be made up with petroleum from Russia. The need to provide the lacking 1.9 million barrels per month and the urgency to gain possession of the Russian oil fields in the Caucasus mountains, together with Ukrainian grain and Donets coal, were thus prime elements in the German decision to invade the Soviet Union in June 1941. The smallest of the Russian oil fields at Maikop was captured in August 1942, and it was expected that the two remaining fields and refineries in Grozny and Baku also would fall into German hands. Had the German forces been able to capture these fields and hold them, Germany’s petroleum worries would have been over. Prior to the Russian campaign, Maikop produced 19 million barrels annually, Grozny 32 million barrels, and Baku 170 million barrels. Grozny and Baku, however, were never captured, and only Maikop yielded to German exploitation. As was the case in all areas of Russian production, the retreating forces had done a thorough job of destroying or dismantling the usable installations; consequently, the Germans had to start from scratch. In view of past experience with this type of Russian policy, such destruction was expected, and Field Marshal Hermann Göring’s staff had begun making the necessary preparations in advance. But a shortage of transport that was competing with military requirements, a shortage of drill equipment as well as drillers, and the absence of refining capacity at Maikop created such difficulties that when the German forces were compelled to withdraw from Maikop in January 1943 in order to avoid being cut off after the fall of Stalingrad, Germany had failed to obtain a single drop of Caucasian oil. Nevertheless, the Germans were able to extract about 4.7 million barrels from the Soviet Union, a quantity that they would have received anyway under the provisions of the friendship treaty of 1939. Even before the Russian prospects had come to naught, Romania had developed into Germany’s chief overland supplier of oil. From 2.8 million barrels in 1938, Romania’s exports to Germany increased to 13 million barrels by 1941, a level that was essentially maintained through 1942 and 1943.7 Although the exports were almost half of Romania’s total production, they were considerably less than the Germans expected. One reason for the shortfall was that the Romanian fields were being depleted. There were other reasons as well why the Romanians failed to increase their shipments. Foremost among these was Germany’s inability to make all of its promised deliveries of coal and other products to Romania. Furthermore, although Romania was allied with Germany, the Romanians wished to husband their country’s most valuable resources. Finally, the air raids on the Ploesti oil fields and refineries in August 1943 destroyed 50 percent of the Romanian refinery capacity. Aerial mining of the Danube River constituted an additional serious transportation impediment. Even so, Romanian deliveries amounted to 7 million barrels in the first half of 1944 and were not halted until additional raids on Ploesti had been flown in the late spring and summer of 1944. Even with the addition of the Romanian deliveries, overland oil imports after 1939 could not make up for the loss of overseas shipments. In order to become less dependent on outside sources, the Germans undertook a sizable expansion program of their own meager domestic oil pumping. Before the annexation of Austria in 1938, oil fields in Germany were concentrated in northwestern Germany. After 1938, the Austrian oil fields were available also, and the expansion of crude oil output was chiefly effected there. Primarily as a result of this expansion, Germany’s domestic output of crude oil increased from approximately 3.8 million barrels in 1938 to almost 12 million barrels in 1944.10 Yet the production of domestic crude oil never equaled in any way the levels attained by Germany’s other major supplier of oil, the synthetic fuel plants. A cynic could conclude that Hitler was right in attacking Crete in 1941(thus protecting the Ploesti Oilfields),that the southern advance to Kiev rather than Moscow in 1941 at least placed the Wehrmacht closer to the Caucasus and its oil,and that Fall Blau in 1942 was in an economic,strategic sense a proper move. He took a lot of critisizm from manstein for his refusal to abandon the crimea and the dnepr bend. He lost AGC trying to cover the Romanian oilfields and wasted all his reserves to save the Hungarian fields at balaton. Most of his "Insane" decisions were based on solid economic concerns. 12mb/d. That is far less than half of what OPEC produces per day at the moment, 29.5mb/d. A lot less than current daily use in the US (ca. 21mb/d). Interesting. Learn something new every day. 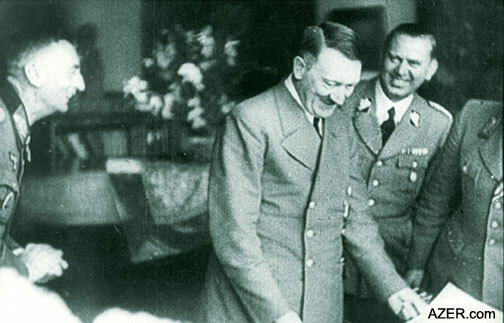 During World War II, Hitler was set on capturing Baku's oil fields to fuel his own efforts of the war. 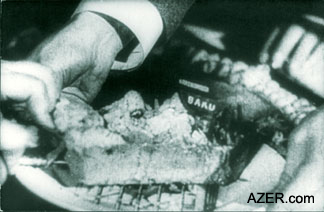 At that time Baku's oil was providing almost the entire supply of fuel for the Soviet resistance. Hitler's plan was to attck Baku on September 25, 1942. Anticipating the upcoming victory, his generals presented him a cake of the region - Baku and the Caspian Sea. Delighted, Hitler took the choice piece for himself - Baku. Fortunately, the attack never occurred and German forces were defeated before they could reach Baku. Photos from documentary film. The Allies were not unaware of Hitler's goals and had drawn up a map of the oil wells in Baku's city which they intended to bomb if Hitler managed to take Baku. Very interesting article, thanks for posting it. I was surprised to learn that Germany depended so strongly on Mexican oil pre war - were there imports from Venzuela too? AFAIK, most Italian oil imports pre war came from the USA. Texaco continued supplying oil also after the League of Nations embargo that was enacted in reaction to Italy's war in Abyssinia. Rumanian oil was important to the Italians too, but Mussolini lost the race for influence over that country. It is tempting to see WWII purely as a struggle for oil and nothing else. 3/4 of germanies oil needs came from imports with the synthetic industry taking up the slack. It should be understood that prewar politics demanded that Germany defeat the bolshie threat, that was highest importance to most in europe. All else are just excuses to act when they did, but that action was inevitable. In reading Overy's "The origins of the Second World War", its clear that one single fact more than anything molded the prewar years. All sides flirted with each other to get the best balance of security concerns between european countries and Soviet Union. While the threat the Nazis possed was real it was understated. Soviet threat had been fully stated since 1917 and all the capitalist countries knew this including the facist ones. There was even a point  where British diplomants figured they had to through their lot in with the germans against the increasing threat of soviet industrialization. If you want a detailed break down on fuel history read the USSBS...I'll see if I can find some links? Theres also other reports on german motorvehicles , tank production and chemical industry. It is interesting that the Soviet Union prior to Barbarossa supplied such a small part of Germany's oil consumption, and that even with the imports from the Soviet Union Germany suffered an oil deficit that would have brought its war effort to a halt in August 1941, thus causing its defeat. It seems that in early 1941 Hitler was faced with the choice between screwing more oil out of the Soviet Union or surrendering. No doubt Stalin would have resisted any German demand for increased oil deliveries, or at least made such an increase dependant on greatly increased German deliveries of manufactured products that Germany would have been incapable of meeting. Viewed in that light, the German invasion of the Soviet Union appears inevitable, even without the ideological aspect. Your comment on "screwing the Soviet Union out of more oil" is quite accurate. The Soviets were quite aware of Germany's desperate need for petroleum. During the Russian-Germany Non-agression Pact of 1939 several Russian generals commented on the German's negotiation of the list of commodities, prducts and services to be exchanged as a condition of the treaty, noticed the keen emphasis on maximizing the amount of petroleum obtained during these negotiations. When the Whermacht launched Fall Blau in 1942 and not resume the advance on Moscow, STAVKA had all the confirmation they needed as to what the German intent and objective was. The failure to capture the oilfields was a major blunder bye Hitler. His obsession with Stalingrad cost him the oil. The Germans was not capable of driving both towards Caucasus and capturing a city built manly in stone. The initial case blue plan did not include the meaningless attack on Stalingrad. If successful in capturing the oil he would have crippled the Russian war effort for good. It was even worse than that. The whole Plan Blue concept was faulty. The Soviets destroyed the oil-wells and the refining capacity and while there was surplus refinery capacity in Rumania (a legacy from Rumania´s higher oil production in the late thirties) there weren´t enough trains, oil-tankers etc. availbale to make the Caucasus oil a meaningfull contribution to the German war effort. But yes, taking the Caucasus out would place Uncle Joe in a situation similar to the German one after the oil famine really hit from mid-1944. Worthwhile for sure, but the Germans would gain very little real oil by taking the Caucasus. As a German fringe benefit, the Allied oil tanker capacity would be very strained as Uncle Joe would have to get his oil all the way from Texas. A very accurate assessment of the major flaw in Fall Blau. I have read in several other sources of your conclusion and they are all the same. German stretegic thinking may have been adequate for the assault on the Caucasus, however the required economic, logistic and technical requirements were entirely inadequate for the proposed task. It appears that Hitler was resigned to worry about 'that problem' when it arrived. An analysis of several routes back to Germany for the oil, refined or not would have exposed the precious fuel to almost impossible interdiction threats or transshipment requirements simply did not exist. There may have been extraordinary amounts of oil at Baku but Germany had no way of utilizing it once seized. The weather turned "totally crappy" all over the Caucasus on September 13th 1942, AFAIK. I´ve seen it argued that the Germans had to reach and capture 2 passes in central Caucasus (The Tiblizi military road and - I think - The Ossetia military road) which were both 3 kilometers above sea-level before this date, or alternately choose the costal roads along the Black Sea and the Caspian Sea, or the minor lower central Caucasus passes where mountain troops and cavalry could pass but not motor-vehicles. Can this really be true, that the window for crossing the Central Caucaus with panzers and trucks closed down this early? How likely do you think a success along the most heavily defended axis towards Moscow would have been? Also, a two-thrust strategy was in effect in operation - the second thrust was aimed at Leningrad, with the transfer of 11. Armee to take the city in September. This attack never happened because the resources for the attack were chewed up in defending against the Soviet operation aimed at destroying 18.Armee (named "Polar Star", IIRC). Essentially this attempt was defeated by the Soviets with local resources. They still had sufficient resources left after defeating it to (barely) hold on to Stalingrad and the Caucasus, and from November starting two major multi-front offensives in completely different sectors of the front, MARS and URANUS. From this, I would think that any attempt to play off the Caucasus against Moscow would have been in very deep trouble right from the start. The Red Army probably did have the resources to defeat both at the same time. If the attack on Moscow was in the form of a fixing attack by encirclment with the bulk of the german infantry divisions, this would have rivetted soviet/stalin attention at the expense of all others. Thus a lighting mobile strike to the south would have meet little resistance , provided the soviet strategic reserves had been thrown in to save Moscow from encirclement. By not defeating the soviet strategic reserve before launching into the vast lands in the cacauses , the germans left themselves open to the inevitable counter attack when the lines had been stretched too far. As I recall the soviets made this same mistake against the poles in the 1920 war. By not dealing with the polish reserves, they left themselves open to counterattack when they had stretched themselves to the limit at Warsaw. The way to win in a situation like this is to 'pin' the enemy against an objective that he is compelled to stand and defend 'at all costs' , if need be. Once the enemy has invested his strategic reserves into such a defence, an operational maneuver can be conducted to 'exploite' the vacum that is created by such a move. Better would be to catch their strategic reserve when its rushing to the 'rescue' of Stalin at Moscow and envelope it in a climactic maneuver battle , which the germans would inevitably win. Once disarmed all kinds of possible operational manuevers are opened up. Once this had been completed the southern advance would not have needed much in the way of forces, but it would have to be excuted after the soviets shift their reserves to Moscow to attempt an breakout....and are defeated. Operation Mars showed how poor the soviets still were at this stage in the war.